The state of the rural government schools, when available, where Rescue Pink works is completely inadequate. Lack of accountability with the school system means children basically go to school to sit all day without learning anything. That's why we make it a goal through our Women's Entrepreneurship Program to encourage every mama to get their girls into private school as quickly as possible. Most of our moms have been successful in this, and happy to do so. Giving their daughters an adequate education changes everything for her. Forever. It breaks the terrible cycle of poverty which puts girls at extreme risk of infanticide, being trafficked, child marriage or death. 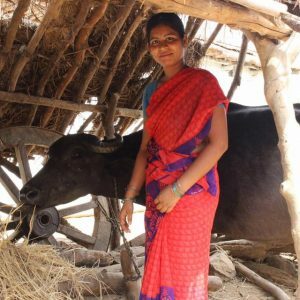 Kavitha is one of the recent graduates from our Entrepreneurship Program and purchased a buffalo in order to sell milk in her village. She says that Rescue Pink has helped her to fulfill her dreams and taught her to stand on her own two feet. She loves having a business all to her own and making her own money. This gives her value in her household and keeps her involved in the family decisions. She feels empowered that she can now contribute and make good decisions for her children because of it. So far, her extra income has provided them the opportunity to send their children to private school and saving for their daughters future. 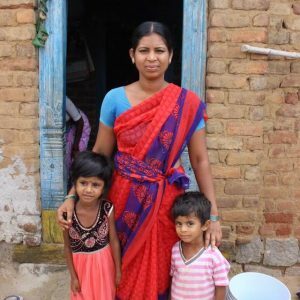 Kavitha says she dreams to continue to be able to provide her children with a good education and hopes to give them a bright future of their own choosing. Thank you for giving to Rescue Pink and changing the lives of so many women like Kavitha and her daughters. Not only that, but you are providing self-sustainable changes that affect generations for the better. Thank you so much, from the bottom of our hearts!